Who will represent the youth in the Advisory Council? 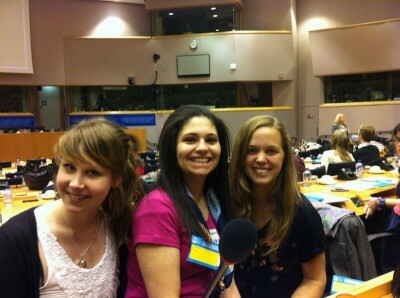 Earlier this year I went to the Council of Members meeting of the European Youth Forum in Brussels, as a representative of the European YWCAs. The ‘big thing’ during this meeting with the more than 100 Youth Organizations of Europe was the election of 20 youth representatives for the Advisory Council of the Council of Europe. Next to the fact that it was wonderful to see everybody again that I met in November 2012, it was also a good opportunity to create new relationships, hear about all the opportunities for the YWCA within the Youth Forum, and to strengthen the knowledge of existence of the YWCA. (What? The YMCA? No, that’s another organization. I am from the young WOMENs Christian Organization). Well… I have some fixing to do here! However, so far I have established a good relationship with the other faith based organisations (like the YMCA, the World Association of Girl Guides and Girl Scouts who are similar to the YWCA, the scouts, and a few other faith based organisations like the Jewish students and Ecumenical youth). We work together in preparation of the meetings of the Youth Forum and share our experiences and expertise. It is nice to have such a pool of experience at my disposal and a group of people to go to for advice. And apart from that they are wonderful people too! I am very happy with the people that got selected for the Advisory Council! Among them are for instance the World Association of Girl Guides and Girl Scouts (WAGGGs) who will help the YWCA ensure that gender equality will be on the agenda, the YMCA who share the same values as the YWCA and other organisations that will make sure that the youth (both men and women) will be included in decision making. Next time I want to take one young woman from a European YWCA member association to the Council of Members and/or the General Assembly to share the learning and the huge opportunities, and to increase our partnership with Youth Forum.